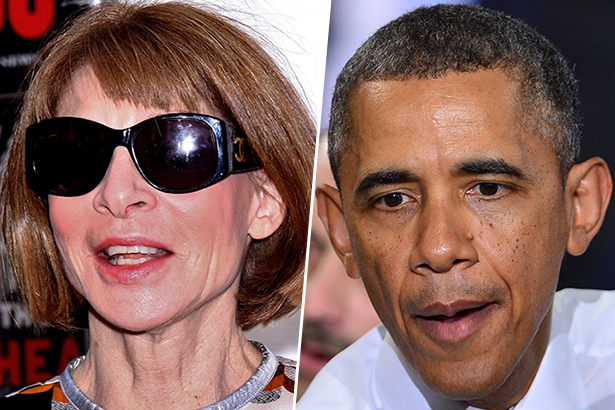 Last night, Vogue editor-in-chief Anna Wintour hosted President Obama for a fundraiser in her West Village home. According to The Hill, approximately thirty guests donated up to $32,400 to attend the event. Last May, The New York Times reported that Wintour had raised over $2 million for the President, making her the fourth top fundraiser among Obama bundlers. The event was one of three fundraisers the President attended yesterday evening, following a roundtable discussion for the Senate Majority PAC and an LGBT gala hosted by the DNC. The Wintour dinner was closed to the press and there's no word on whether Wintour's BFF, First Lady Michelle Obama, was able to attend.